Our fire department, being situated in a majority of rural area in Rapho Township often relies heavily on new ideas for generating income to remain operational. 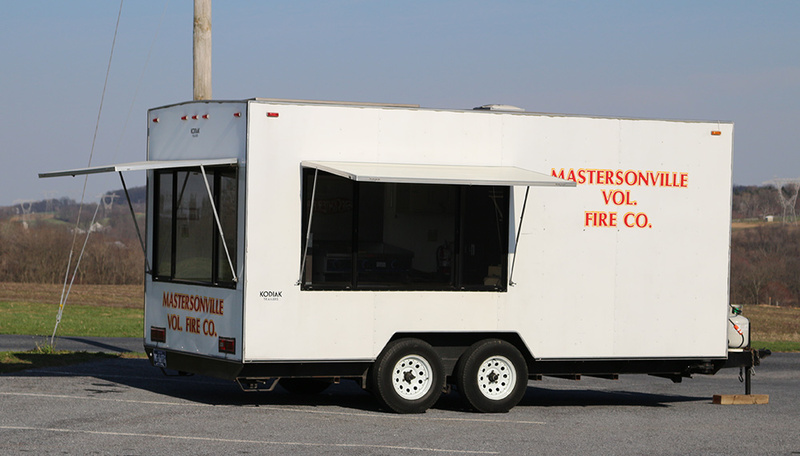 The Mastersonville Volunteer Fire Company Food Trailer is yet another way to show the community our want and need for their support. Originally started by our Ladies Auxiliary Chapter within our fire department, the food trailer has been an exciting and useful tool for generating income, meanwhile providing the people of our community with a new source of recreation. In recent years the group has disbanded and in an effort to keep the service available to the public, members of our fire department have continued to volunteer their time to keep it available and in use. The Food Trailer is a 1998 Kodiak, 16 foot trailer and is essentially our “kitchen on wheels”. Recent uses in the community have been for organizational functions such as: Auctions, Sporting Events, Social Functions, and Business outings. In an event to keep up with the growing costs to keep a fire department functional, we are always looking for new events to earn money for our fire service and still provide a good service and experience for those in and around our community. The menu of the food trailer is constantly adapting to the seasons’ bookings and adding exciting options for patrons at any event. Our general menu options usually consist of: Hamburgers, Hot-Dogs, French Fries, Homemade Chicken Corn Soup, Miscellaneous Homemade Baked Goods, and an Assortment of Beverages. Many more menu options are updated event by event, so contact us today to book our food trailer at your next event! For Food Trailer bookings and questions please email Eric at: josepheshields27@outlook.com. For all other inquiries about the food trailer, menu, or other questions please call and leave us a message at (717) 665-5192.